I just finished this painting of my sister's cat, Wyatt, as commissioned by the veterinary clinic where she works as a going away gift. It was done in a acrylic on gessoed illustration board, 11.5" square. I enjoyed painting it in continuation with the other two cat paintings I did for her these past months. I just hope she likes it as well! I really like your realistic animal portraits. I do think they are very different from your illustrations, but they still feel as though they are made by the same hand. I think you could get a lot of work marketing yourself as a pet portrait artist. I think a lot of people think that pet portraits are a little hokey, but I love painting dogs, and think animals' personalities are as interesting as peoples'. 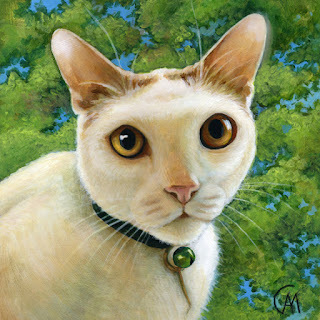 Check out Braldt Brald's paintings, your cat paintings remind me of his, I think his paintings are great. I hope this link works . . .